Clockwise: Hotel Valencia; Santana Row; Westfield Valley Fair; Santana Row; Winchester Mystery House. 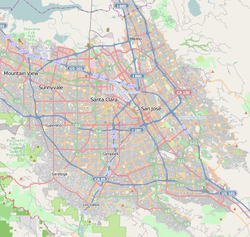 West San Jose is the western region of San Jose, California in Silicon Valley. The area of West San Jose is bounded on the north by the city of Santa Clara, on the east by San Tomas Expressway, on the south by Prospect Road, and on the west by De Anza Boulevard. The eastern boundary of San Jose City Council District 1 is at State Route 17. Attractions in West San Jose include the historic Winchester Mystery House, a California historic landmark, as well as over 20 movie theaters, such as AMC Saratoga 14, and Santana Row's Ciné Arts. Most of the housing was built in the 1950s as moderately priced housing. In the last several decades, the neighborhood became upscale as the median housing value rose to over one million dollars, especially in the western portion of West San Jose bordering Cupertino and Saratoga. Nearby commercial/retail includes Santana Row, the Westgate Mall (San Jose), and El Paseo de Saratoga. The major thoroughfare of the area is Stevens Creek Boulevard, one of Silicon Valley's premier shopping streets. The eastern portion of West San Jose is served by the Elementary and Middle Public Schools at the Moreland School District, including multiple California Distinguished Schools. The western portion of the neighborhood is served by the Cupertino Union School District and the Fremont Union High School District. ^ "City Council District Maps". City of San Jose. Retrieved 2008-02-03. This page was last edited on 5 April 2019, at 22:55 (UTC).